Check out some of our photos from the 2011 SA Block Party! Do you have some of your own? Share in the comments! The Student Association would like to thank everyone that came out to our BLOCK PARTY 2011! It was a huge success! We would also like to extend congratulations to Sara Johnson, the grand prize winner of our SA ReadyU scavenger hunt! Sara, please stop by our office in CC 116 to claim your ticket to the VIP reception. Pictures from Block Party 2011 will be posted shortly! 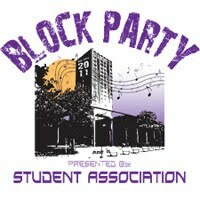 The SA Block Party has been rescheduled for September 25th, 3:30pm-7:30pm in Dutch Commons. More details can be found on our Facebook page. Student groups should confirm they have reserved at table here. Student Association Presents Block Party 2011- an event you don’t want to miss. The one-stop spot for all your questions about how to make the most of your semester! It’s a great opportunity to meet with student group leaders. Your Student Activity Fee provides you with hundreds of organizations, with groups ranging from political and cultural to religious, social, service, athletic, arts, media, pre-professional, or academic, there's something for everyone! Meet your Student Association leaders as well and learn how to get involved! Bring your friends, meet new friends and enjoy FREE food, music and tons of giveaways! Click here for more details. As the Legislative Affairs Director you are responsible for advocating on behalf of the 12,000+ undergraduate students at the University at Albany. You will also be working closely with the NYS Legislature to lobby for issues pertaining to higher education. You will work closely with the University Office of Government Relations. Thanks to everyone who participated in the Fall Elections. Below are the elected living area senators. To all new Senators, please remember that the first SA Senate meeting is this Wednesday the 21st at 8:30 in the Assembly Hall. You must be there so that you can be sworn in. Don't forget to vote for your living area representatives! Voting begins September 14th at 12am and ends on September 15th at 11:59pm. Log into MyUAlbany, click "Campus Life" at the top, then "Student Elections" on the right and VOTE! Update: The polls are now closed.